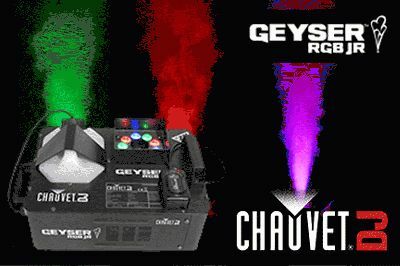 DJzone DJ Magazine :: CHAUVET DJ Geyser RGB Jr.
CHAUVET DJ, a leading manufacturer of LED lighting, introduced the new Geyser RGB Jr. at the LDI 2013 show in Las Vegas last month. The Geyser RGB, Jr. is a compact version of the unique, pyrotechnic-like fixture, the Geyser RGB, that adds a dramatic effect to any performance. This powerful effect fogger blasts a 15-foot high vertical stream of safe, water-based fog into the air, while simultaneously illuminating it using nine high-power, 3-watt RGB LEDs. The combination of red, green and blue LEDs allows you to easily mix the perfect color to transform the fog into a stunning effect. The Geyser RGB, Jr.’s lightweight and compact size makes it perfect for mobile applications and it features wireless control of independent colors using the included Geyser™ Wireless Remote. The Geyser RGB, Jr. can be mounted upright, inverted or vertically giving users increased mounting flexibility and creativity. The easy-to-read digital display makes setting functions easy. The Geyser RGB, Jr. fits best in the CHS-30 VIP Gear Bag.